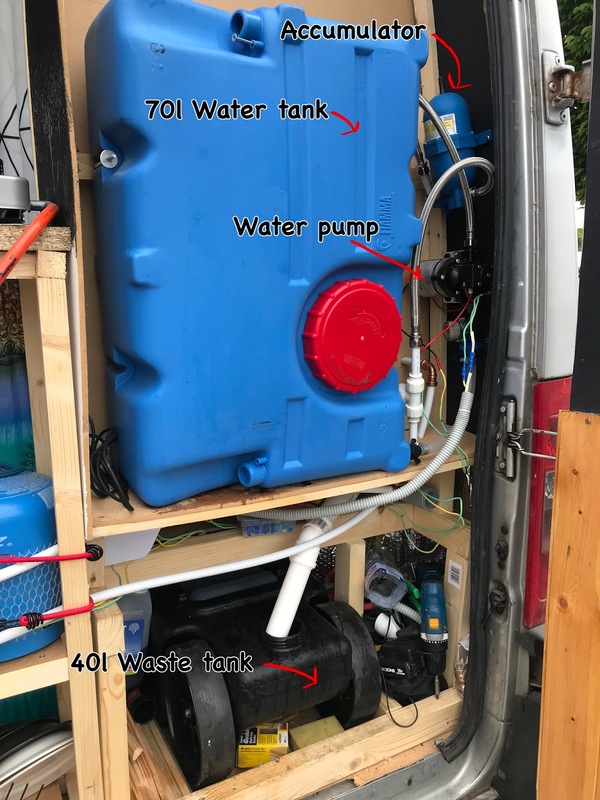 Water system is at the back of the van. And absolutely mess. We are going to cover up with some MDF panel or fabric later. Anyway, it is very simple system because we don't have a water heater. Actually, it's broken when we tested it for the first time. Literally, it just broken a part from water valve to water tank. We bought it on eBay and it was totally rubbish. I recommend to never buy a second hand water heater from commerce website. SURFLO Water pump connected with a Fiamma Accumulator. Accumulator, which is a expansion tank hold a pressurized water in it. I think it isn't necessary part of the system. But it provides smooth and flawless water to your tap. Also it make your water pump life longer. We didn't want to drill the floor to make a hole for waste water so raised the shower booth floor and put a 40 litre waste tank under it. It has two quite sturdy wheels so easy enough to pull to the service area or the toilet. We are still building and mending our van so lots of tools and spare parts are in the back.